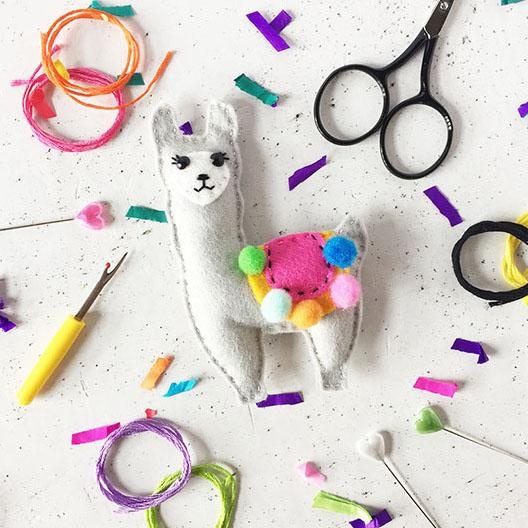 Stitch up and awesome Llama keyring or badge with this DIY felt craft kit. Whether a curious beginner or established sewer this kit provides everything you need to make and sew a cute Llama. In each kit are a set of instructions to cut and sew the Llama to then use as a keyring or make into a really cute badge. The directions are fully photographed so perfect for beginners and all the materials and supplies are included. Each kit is packaged in a small jar and includes: Felt, key chain/badge pin, needle and thread, stuffing and instructions. The only thing you’ll need is a pair of scissors and possibly a few pins. Oh, and a cup of tea and a biscuit to help the job along..
Love this kit – check out our other felt craft listings!